When the sun sets and the humidity starts to ebb, Hong Kong really comes alive! Join us on a night tour of Kowloon, affectionately known as the ‘Dark Side’ of Hong Kong, and see the city at its grittiest and most captivating. Over the course of the night tour, we will undertake an in-depth exploration of Kowloon, learning about its history, including just how it became a part of the British empire and its transformation through to the modern day. Private night tours can be booked for any day of the week and can start at any time between 3 pm and 5 pm. Your night tour lasts 4 hours, 5 hours if you book the tour and also require a hotel pick-up. An in-depth exploration of Kowloon. The night tour starts with a visit to Kowloon Walled City Park, the former site of the notorious Kowloon Walled City slum. The slum that grew up within the Kowloon Walled City was the most densely populated area ever to exist on planet earth. A sprawling shanty town, ostensibly under the control of China, and thus left unpoliced by the British, it was almost entirely outside the law. Building codes and health and safety codes were entirely disregarded, resulting in the construction of dozens of ramshackle multi-story buildings. The laneways through the slum were so dank and dingy that residents routinely moved from rooftop to rooftop to get around! Life in the Walled City was well documented by documentary filmmakers, photographers, social scientists and the international press. It was featured in the 1988 cult film Bloodsport, and Jackie Chan fans will know it from his popular film Crime Story. Today, a peaceful park is located where the Walled City slum once stood. We will visit the park and discover how the slum came into existence — and what really went on inside it. From Kowloon Walled City Park, our walking tour takes us into Kowloon City, which is known as ‘Hong Kong’s Little Thailand’. 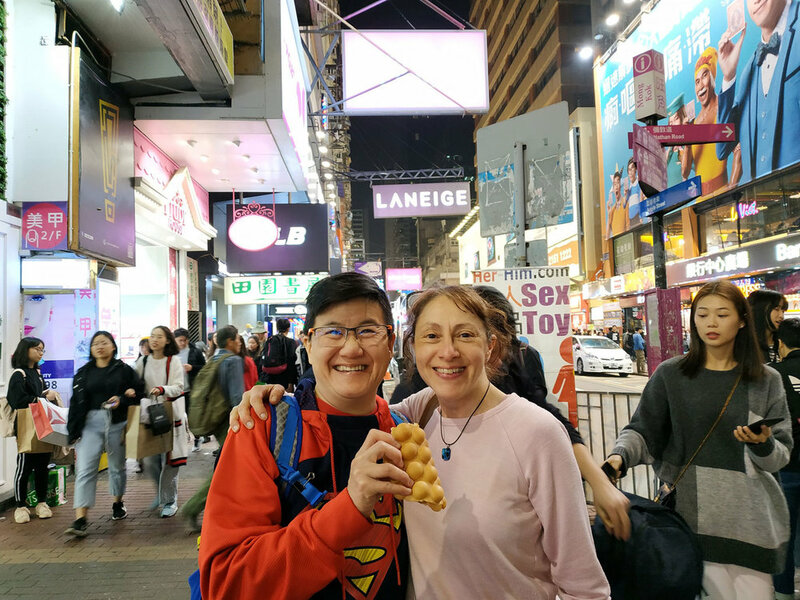 Here we will try traditional Thai street food, as well as a local Cantonese delicacy from one of Hong Kong’s most famous and beloved bakeries. Our night tour adventure continues in Mong Kok, a district famous for its shopping, markets and glimmering neon lights. It is also a centre of Triad (criminal gang) activity in Hong Kong. It is here that we will learn more about organized crime in Hong Kong whilst we relax with a cold beer. We will then explore the bustling streets of Mong Kok, taking in the famous Goldfish Market, electronics streets and Ladies Market. We will explain what is going on inside the masses of high rise buildings surrounding the markets. Prostitution, illegal gambling and subdivided living is all rife in the Mong Kok district. 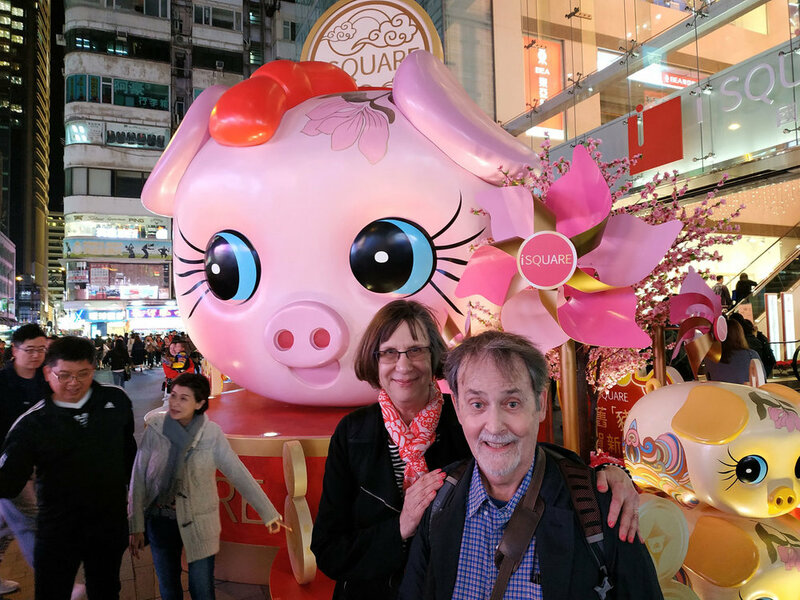 From the gritty and frantic streets of Mong Kok, we make our way to the more glamorous district of Tsim Sha Tsui on the peninsula of Kowloon. Here we visit Chungking Mansions, a dilapidated 17 story building built in the 1960’s full of cheap guesthouses and cut-rate businesses in the middle of some of the most expensive real estate in Hong Kong. A social scientist wrote a book about the building after conducting a 3-year study on it and the thousands of people that pass through it every day. We will talk about the building and its fascinating story. From the cheapest place to sleep in Hong Kong, we cross the road and visit one of the most expensive places to sleep; The Peninsula hotel. This beautiful art deco building holds its own dark story which will discuss. Continuing we come to Hullett House, another historic building, constructed in 1884 and previously occupied by the Marine Police. Our tour ends at the Tsim Sha Tsui waterfront where we discuss the history and development of the Hong Kong skyline from the early 1800s to the present day. Four-hour tours starting at 4 pm will finish just in time for the 8 pm light show! Due to the adult content, the tour is NOT suitable for children. Guests must be at least 16 years of age. Prices include 2 drinks per person (beer/wine/soft drinks) and a snack. Prices listed do not include the costs of transport to get to and from the start and end points of the tour but do include the costs of public transport used during the tour. If you book a private tour and would like to be picked up from your hotel you will need to add on an extra hour when booking. Extra hours cost HK$300 in total for the entire group. For more than 8 people please add HK$350 per person. Like all Hello Hong Kong tours this is a walking tour. You need to be able to walk 5 miles / 8 km at a reasonable speed to join this city tour. It is not suitable for people with walking difficulties. WHEN/Time: Private night tours can run on any day of the week, can start any time between 3 pm and 5 pm and last 4 hours. If you are booking a private tour and would like to be met in your hotel lobby you will need to add an extra hour on when booking. STARTING POINT: Lok Fu MTR station (directions sent upon booking). If you book a private tour and add on an extra hour we can meet you in your hotel lobby. END POINT: Tsim Sha Tsui waterfront (next to the Star Ferry). 4 hour tours starting at the 4 pm finish just in time for the famous 8 pm light show!